Sweden on Friday said 200,000 chickens were being slaughtered at a farm where bird flu has been detected, following a resurgence in the virus across Europe. Traces of the H5N8 virus were found at the Aniagra farm in Morarp, southwest Sweden, on Thursday. The discovery came after bird flu was detected among ducks at a tiny farm in neighbouring Denmark, in the Copenhagen region. "All of the farm's 200,000 hens will be put down to prevent the expansion of the virus," Sweden's agriculture department said in a statement, adding that 37,000 of the birds had already been slaughtered on Thursday. 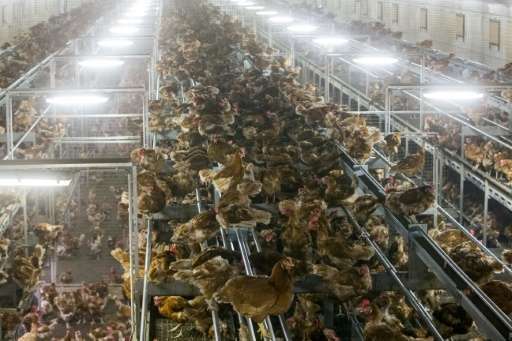 Government scientist Karin Ahl said the operation would "take time as this is a large farm, above all if one thinks of the crucial disinfection that needs to be done at all of the sites". Aniagra chief Anders Lindberg told the local newspaper Helsingborgs Dagblad on Thursday: "It's a heavy blow of course, but for the moment what's important is that we do not allow the virus to spread further." The agriculture department stressed that there is no danger of eating eggs from the farm—or Swedish poultry products in general—as the H5N8 virus has never been transmitted from birds to humans. The H5N8 virus has been detected in poultry and wild birds in 10 European countries, according to the World Health Organization: Sweden, Denmark, Germany, Austria, Croatia, Hungary, the Netherlands, Poland, Switzerland and Russia. Last week the Netherlands shuttered petting zoos and banned duck hunting as it stepped up measures to stem its bird flu outbreak, blamed for killing scores of poultry and more than a thousand wild birds.